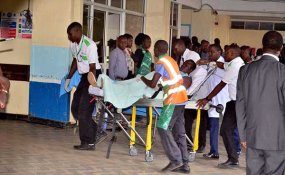 Just six days after terrorists detonated bombs and rained bullets on civilians at 14 Riverside complex, some of the gory photos of event have found their way to the auctioneer's hammer. This is despite an online storm over the publishing of the photos by American newspaper The New York Times, which prompted a review of editorial policies by the media house. Kenyan born photojournalist Kabir Dhanji, who has worked for some of the biggest international media houses, has decided to sell the bloody pictures for as much as Sh50,000 per picture online through Getty Images. Dhanji has worked across Africa, Australia and the larger European Press Photo Agency. Nairobi News combed through the pages of Getty Images, Inc. and found the Dusit terror attack images being auctioned and credit given to Associated Foreign Press (AFP). According to the caption on the images credit should be given to Dhanji, AFP and Getty Images. The photojournalist's works have appeared in The New York Times, Time, The Guardian, The Atlantic, The Times, Le Monde, the Wall Street Journal, The Australian, and the Washington Post amongst other publications. Editors at the New York Times have promised action following accusations of bias in publishing gory pictures from the 14 Riverside Drive attack. It has however remained largely unapologetic despite a demand by the Media Council of Kenya and Kenyans online that it apologises and pulls down the gory images.